It is peak summer already and we crave for something cold all the time. Juice parlours, ice-cream parlours are the most preferred destinations. So when I got an invitation for making my own Sundae at Cream & Fudge last Saturday meant for bloggers I gladly accepted the opportunity to beat the summer in 'cool' way and went there in excitement to make my own sundae. 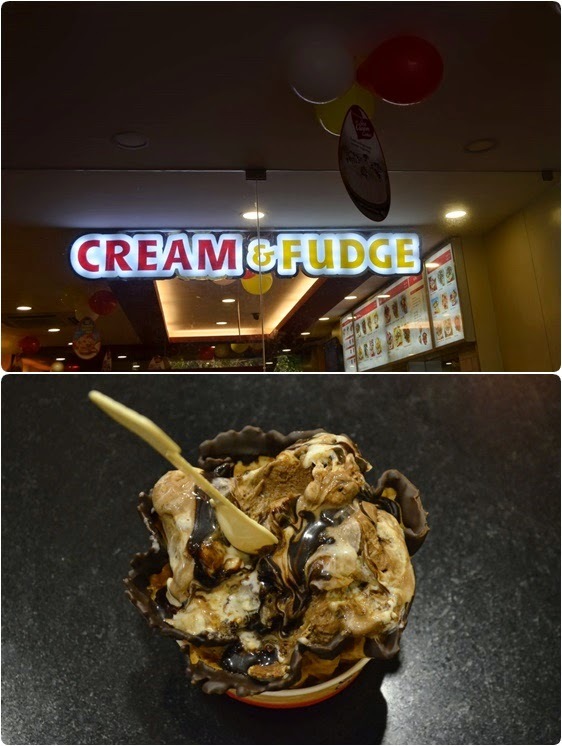 Cream N Fudge offers the world's creamiest ice-creams, is a part of GFA group. The Pizza Corner and Coffee Worlds are two other retails. 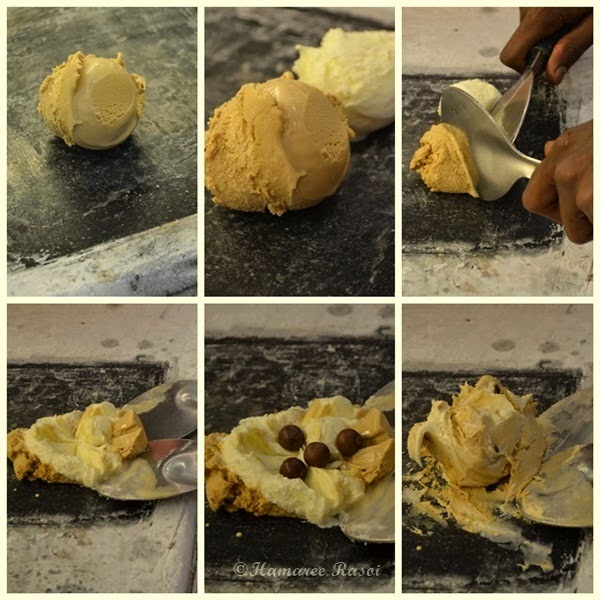 Cream N Fudge offers a mix-in concept of hand folding ice-creams on a frozen marble stone where you can mix it with sauces or fruits of your choice. We were a small set of bloggers to try our hand at the counter and almost all of us got a fair share of time to make our own Sundae. The outlet is small but good place to hang out for youths. 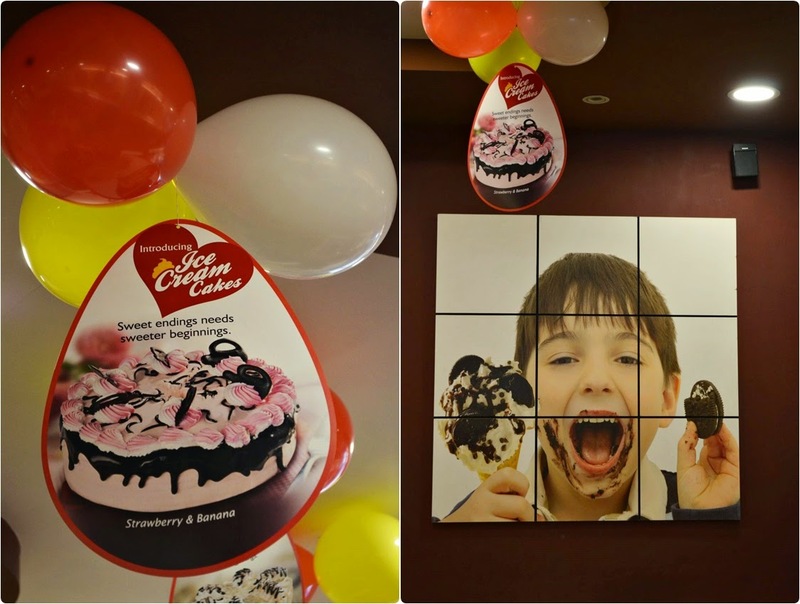 The moment you enter you will find big display of different flavours of ice-cream with a cold stone adjacent to it for mixing flavours. I was an early bird to reach there (yes before time ;-)) so introduced myself to the manager Mr. Irfan at Cream N Fudge. 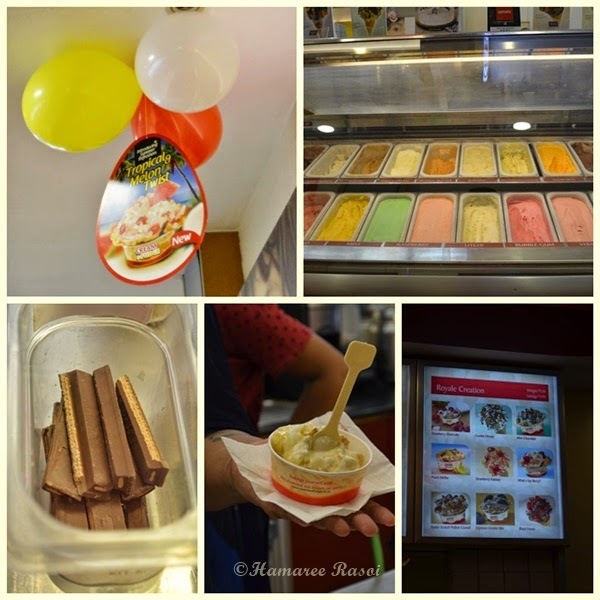 There are three categories of Sundaes at their store: Classique collection, Royal collection and Marble collection which can be served as single scoop (Delight) and double scoop (Indulge). Now you have a choice to enjoy your Sundae in either waffle cups or in cones. The choice is yours : Plain, Chocolate Dipped, Chocolate Rainbow or Nutty Cone. To tempt you more they have variety of Mix-ins (Rs.15/Rs.20/Rs.25) in the menu (my personal choice would be Royal Mix-Ins where they have Ferrero Rochers, Peach Slices to name a few). The prices may seem a bit steep but if you have just Rs.100 in your pocket, restrain yourself from adding any extras then you can enjoy this creamy ice-cream (single scoop). To maintain the hygiene we all are handed over caps to cover our head and we were shown how to make our own Sundaes. The folding techniques of spatulas to mix in two flavours of ice-cream scoops with Mix Ins on the cold stone was a good learning experience. 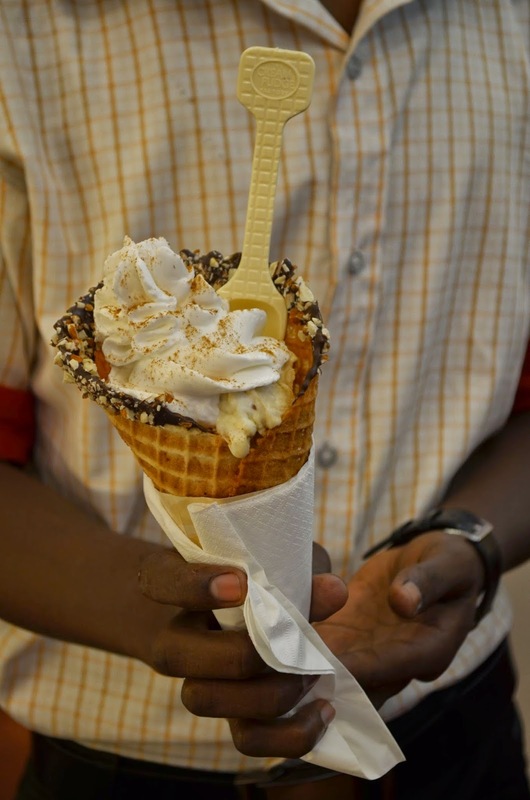 Later Pari and I decided to make Cafe Au Lait which had Coffee Ice cream, Nuts, Cocoa powder, Whipped cream, Vanilla Ice cream, combined together and we had it in waffle cone. Over enthusiastic assisting aids at the counter had sprinkled Cinnamon powder instead of Cocoa powder over whipping cream which marred the taste of Coffee flavour ice cream. Never mind as other blogger friends were also making their own Sundaes so tasted a spoon of many flavours. Like Aarti made Apple Crumble, as she loves anything with apple and cinnamon. It was sinful. But the surprise element of that day was Pari's husband skilled hands ! He tweaked Chocolate Truffle Sundae with 2 Ferroro Rochers, Brownies and Hazelnuts to suit his taste and boy !! It was fantastic. I wanted to taste Lichi flavour with lichis in it as whole. But it seems they do not stock lichis and mangoes. In between the staff showed their 'throw and catch' skills, where a guy tossed a scoop of ice cream over his head to be caught by another staff waiting with an empty cone. At the end thank you Cream N Fudge for giving us a chance to go behind the counter and make our own Sundaes. Will go there to enjoy other flavours soon. Love that mixing two flavours, seems u guys had loads of fun there. What a delicious day! And so many yummy flavours! Great to see some sundea. Cool. Btw, I tried your kulcha too good.using soda. It came out too good. Will post the recipe soon.